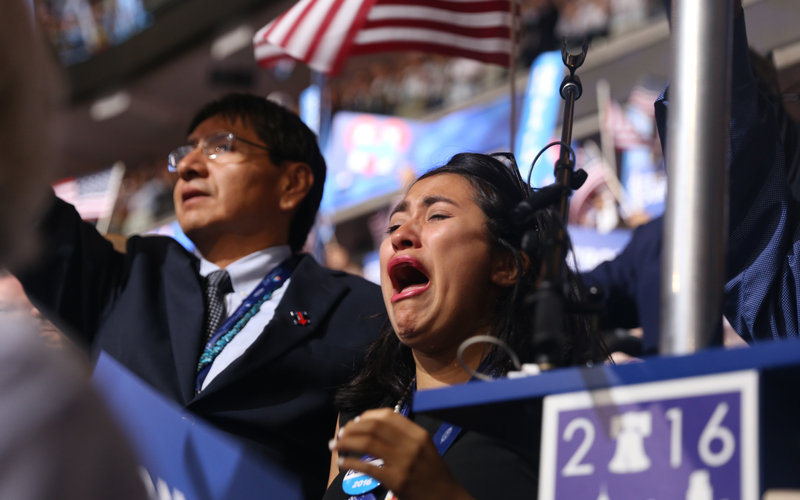 PHILADELPHIA – Tucson resident Joseline Mata, a Hillary Clinton delegate from the beginning, was crying in the stands of the Democratic National Convention Thursday as Clinton accepted the party’s nomination, the first woman in history to do so. For Clinton, it was the end of a road that began eight years ago with a loss to then-Sen. Barack Obama. But Clinton was endorsed Wednesday by Obama and the night before that by her dogged challenger in this campaign, Vermont Sen. Bernie Sanders, whose diehard supporters threatened to disrupt this convention. 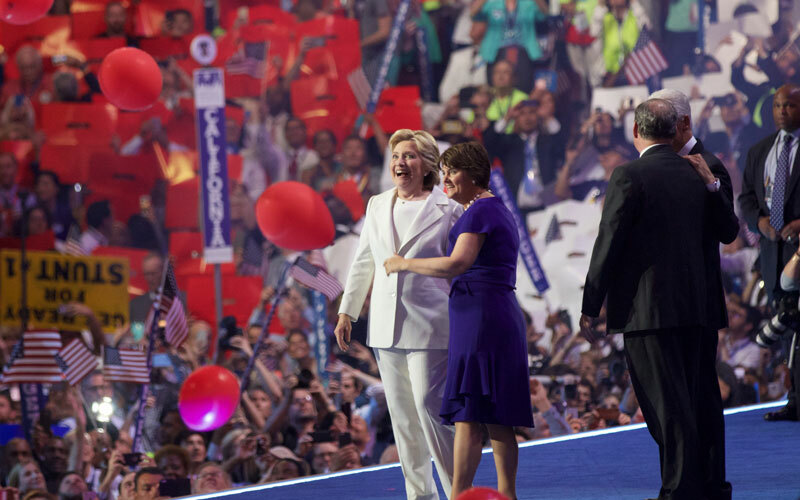 She wrapped up the sometimes-contentious four-day convention with an hour-long acceptance speech that pushed an agenda focused on unity – in the Democratic Party, the United States and the world – as she slammed Republican presidential nominee Donald Trump for creating division and fear. Clinton even left some Sanders supporters emotional and excited to support her candidacy heading into the general election in November. Arizona delegate Jeffrey Tucker said Clinton’s speech was his “favorite part of the night” by far. “I am a Bernie Sanders delegate but I am thrilled to have Hillary Clinton going to be our next president of the United States,” Tucker said. 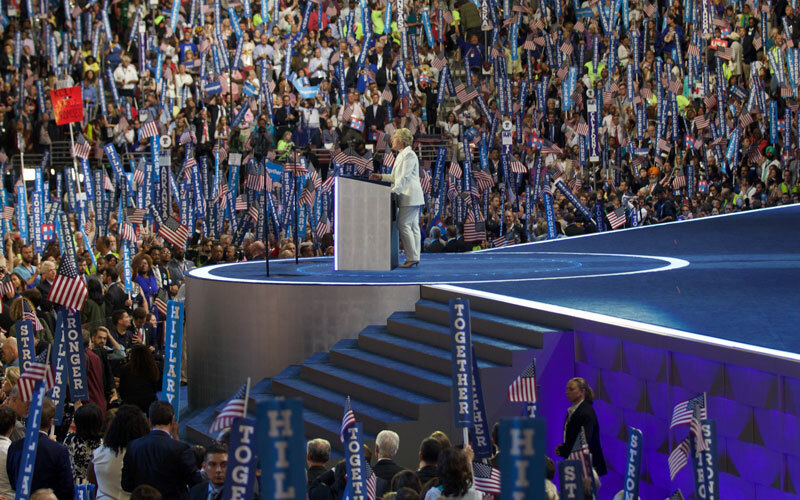 Clinton’s speech followed hours of introductory speeches by scores of elected officials from around the country. 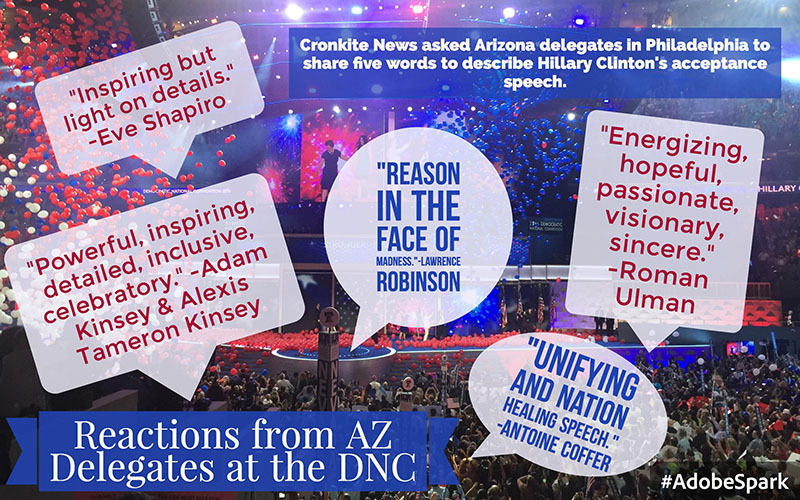 Arizona delegate and former Rep. Ron Barber had said before the speech started that he hoped to hear a concrete plan from the Democratic nominee. “I hope she would lay out her presidency for the next four years so we know exactly what she has in mind,” Barber said. Clinton gave Barber just that, hitting on issues of climate change, immigration reform, gun violence and economic recovery – encouraging everyone who believes in her stances on these to join her. “Whatever party to belong to, or if you belong to no party at all, if you share these beliefs, this is your campaign,” Clinton said. She reminded the crowd that she is not new to the podium and hit on her experience as first lady, New York senator and secretary of state. But the said that the service part of “public service” has always come easier to her than the public. She took on some of the issues central to the Sanders movement – income inequality, free college and overturning Citizens United, the Supreme Court case that opened the door to unlimited campaign spending – as she pushed for unity and thanked Sanders for inspiring youth with his campaign. None of the week’s earlier contention among Sanders delegates was present in the Arizona delegation, whose members were on their feet waving signs with images of Clinton’s face on sticks. Rep. Raul Grijalva, D-Tucson, was one of Sanders’ earliest supporters in Congress, but he said Thursday that he was very impressed with the case Clinton made for party unity. 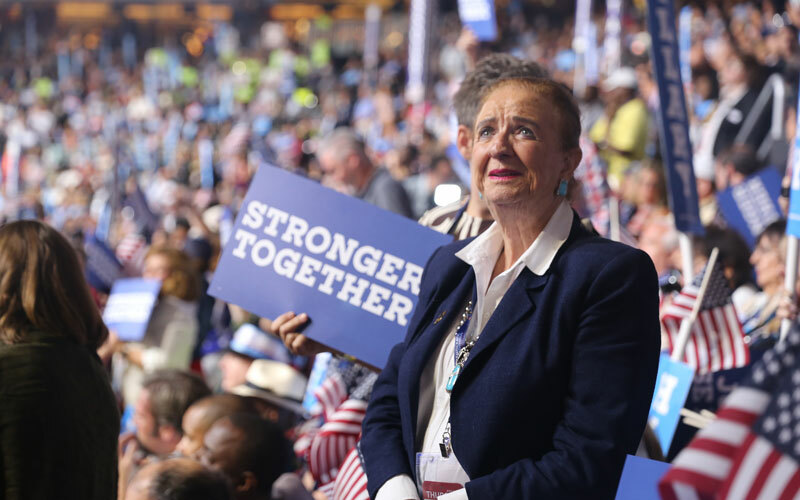 Despite the shock and emotion, Clinton supporters also looked forward to the work ahead to ensure that Clinton wins in the November election. 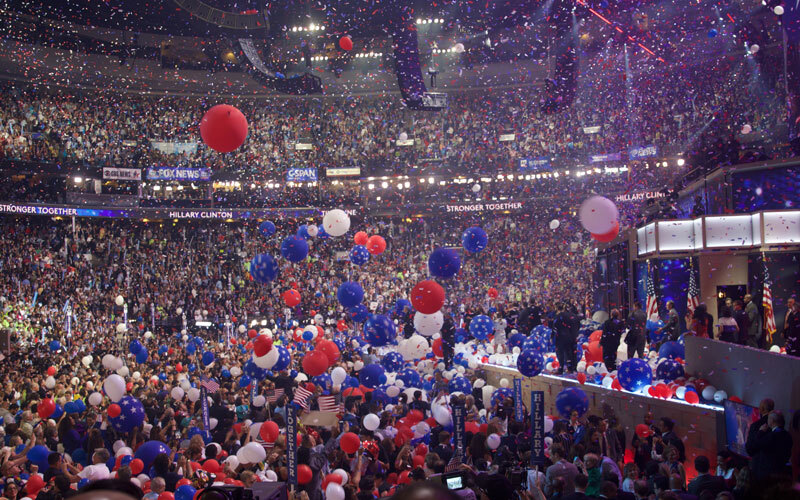 Overall, the speech left Arizonans at the convention optimistic for the chances of a future with a Clinton White House. – Lily Altavena, Keisha Butts and Kelsey DeGideo contributed to this report.